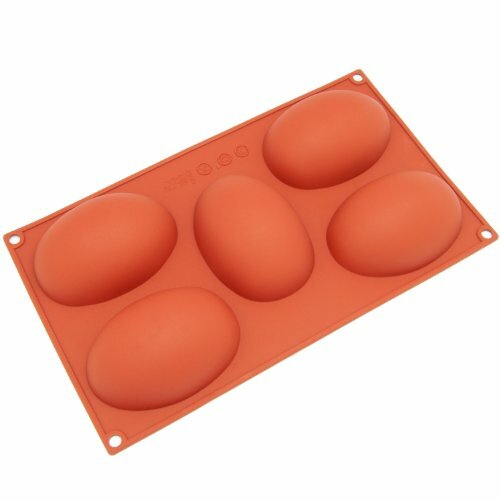 Create your own special desserts or homemade soaps with the Freshware SL-115RD 5-Cavity Silicone Half Egg Muffin, Cupcake, Brownie, Cornbread, Cheesecake, Panna Cotta, Pudding and Jello Shot Mold. This mold is constructed with 100% pure, professional quality food-grade silicone, which meets US FDA and European LFGB safety standards (BPA, PVC and Phthalate FREE). Simply pour your favorite recipe in the mold, prepare, and cool completely. Then turn it upside down, this flexible silicone mold offers a non-stick surface that allows the baked goods to pop right out with a little push from the bottom. Remember to place the silicone mold on a baking sheet for easier positioning and removal. What Is A Pinch Test Cheaper brands often use plastic fillers in their silicone products, so it is not safe for high-temperature baking. Pinch and twist a bit of the silicone, if it turns white, it’s got fillers as 100% pure silicone will retain its color.